Jurgens Centre, Englefield Green, Surrey. (Date). All Praise is due to Alláh, We praise Him and we seek help from Him. We ask forgiveness from Him. We repent to Him; and we seek refuge in Him from our own evils and our own bad deeds. Anyone who is guided by Alláh, he is indeed guided; and anyone who has been left astray, will find no one to guide him. I bear witness that there is no god but Alláh, the Only One without any partner; and I bear witness that Muhammad, peace and blessings on him, is His servant, and His messenger. O You who believe, – Be aware of Allah, with correct awareness, an awe-inspired awareness, and die not except as Muslims. Do you know who you are? I mean, do you know who you REALLY are? This might seem a rather silly question. Most people would reply by saying, “Of course, I know who I am!” And if they are asked to explain, they’d probably give you their full CV: name, address, date of birth, marital status, qualifications, hobbies and so forth. But that’s only a biography. You and I and he and she are much more than a biography. 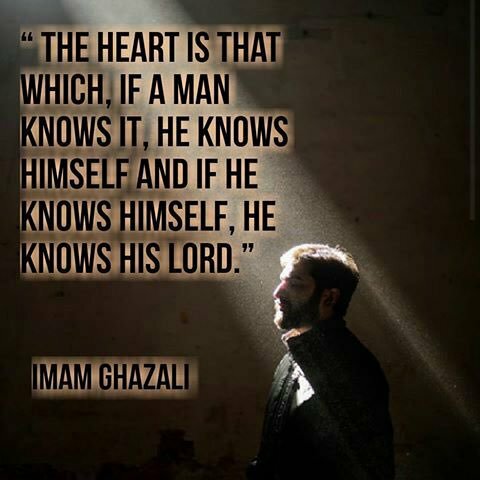 Rasool-Allah once said that “He who knows himself, will know his Lord.” What did he mean by this? How can we know Allah by knowing ourselves better? We are essentially spiritual beings, not just physical bodies. Each one of us has an individual personality. By the way, a person, or personality derives from the Greek “Persona” which means an actor’s mask. We wear different masks; a mask for the public, our public ‘persona’ and a private mask, our private persona. We may think we know who we are, but Allah alone knows what lies behind the mask! So you see, my dear Sisters and Brothers, our Soul already knows Allah. Allah’s Beautiful Names are already imprinted on our Soul. We all love wisdom; Allah is Most Wise. We all love generosity, and you and I can be a little bit generous, but Allah is Al Ghanee, the Most Generous. You and I love to show mercy and compassion. Allah is Al Rahman, Al Raheem. The Most Merciful, the Ever Compassionate. 800 years ago, Jalaluddin Rumi wrote that we seekers are constantly knocking on the door, but we are knocking from the inside! What we seek is not out there! It’s already here within our hearts, within the kernel, the fu’ad of the spiritual heart. That’s where our Ruuh is. But it’s hidden away, covered with the rust of our forgetfulness, our distraction and our sinful behaviour. Within our spiritual heart there is a lifelong battle between the forces of heaven and earth. Our nafs al ammara bis sow, the (lower Self that clings to the earth), and our nafs al law-waamah, (the self-blaming nafs). These demonic and angelic forces struggle to control our behaviour. When our demons win, we give in to our anger, our greed, our selfishness, arrogance and lust. When our higher Self prevails, we are kind, generous, forgiving and patient. We can control these demons in our lower Self by treating them like wild animals that need to be tamed. Do not deny them. Acknowledge them, but be a good zoo-keeper. Keep your wild beasts under control. Always refer to your Higher Self. Refer to your Soul, your Ruuh, the ‘breath of Allah’ within you. The Ruuh never changes, but the spiritual heart, the Qalb, is always susceptible to change. And that’s where we have the greatest challenge: to keep our spiritual heart pure and focussed on the beautiful Names of Allah imprinted on our Ruuh. We can’t do this on our own. We need Allah’s help. We beg Allah to keep our hearts filled with careful Allah-awareness. It’s a very short duah, but it’s so powerful, and it says so much! I pray that Allah will accept this duah from all of us. Through our Salaah and our Dhikr and all our good works, I pray that Allah will turn our hearts constantly towards his beautiful way of life, towards constant remembrance of Allah in our thoughts, our words and our deeds. Say, Ameen! Behold, Allah and his angels shower blessings on the Prophet. O you who believe! Ask for blessings on him, and salute him with a worthy greeting. Soob’ hanallahi wal hamdu lillah, wala hawla wala quwwata illah billah yu althi yual theem. Why does Allah say that the first thing that you and I will be questioned about on the Day of Judgement is our Salaah, our Prayers? We try to do our prayers properly, according to the Sunnah. We try to pray on time. We try to follow the right procedure. But is that all? What’s the most important part that is sometimes missing from our prayers? It’s mindfulness; it’s concentration, focus. Quite often we’ve taken Wudu properly and followed the correct physical motions in prayer, but our hearts and minds are somewhere else. We start thinking about what we still have to do, and we lose focus on the prayers. Our voices recite beautifully, but we’re now flying on auto-pilot. No wonder our prayers are not answered! To make our salaah effective, we must become completely oblivious to everything except Allah’s Presence. We must imagine that we are standing in the grand audience hall of the Creator of the Universe; Allah is waiting to hear every whisper of prayer. Dear brothers and sisters, in our Salaah, every limb faces Makkah. Our hearts and minds must be focussed likewise. Empty yourself of all silly thoughts and focus your entire being: your body, mind, heart and Soul on Allah’s presence. It’s not easy, and it will take lots of time, concentration, practice and patience. But the reward is truly worthwhile. We will definitely have our prayers answered! I pray that Allah will help you and me to purify our hearts, and to perfect our prayers, and likewise, the prayers of all our generations to come. InnaAllaha, Yamuru bil adel, wal ihsaan, wa eetaa-i zil qurba; wa yanha anil fuhshaa-i, wal munkari walbaghi; ya-idzukhum lallakum tathak-karoon. (Sura 16:90), Fadth kuroonee adth kurkum, wash kuroolee walaa tak furoon [2:152]. wala thikrul-Laahi akbar, Wal-Laahu ya’lamu maa tasna’oon.” [29:45].